Mugi is freakishly strong for a girl to be able to carry a glass aquarium that big... plus some boxes on top! She had to be that strong in order to pin down the girls she wants to yuri right? Azunyan made a mistake in quoting Rene Descartes : it is not suppose to be in the literal context : but rather, it should be in the context of thinking of ways to make possibilities come true. They should name the last part of this episode "How to trick Azunyan that Yui will start practicing". They should pay the fansubber if they're paying anybody, since Ritsu cleary said persocom which the translator decided to "localize" into iPad. They should pay the fansubber if their paying anybody, since Ritsu cleary said persocom which the translator decided to "localize" into iPad. Goodness, I want to see her do this to some girl. ANYONE WOULD DO. Except she didn't really quote Rene Descartes, the subbers just did it for the lulz. Send a private message to TakuanInc. Find More Posts by TakuanInc. I thought that was the first aquarium. As long as she doesn't touch my kitty, its fine. I would certainly love to see her do that Mio. Oh wait, she has already done so. In a H-doujin. The quote "I think, therefore I am", or rather, Cogito Ergo Sum came from Descartes's "Discourse Of The Method" (that is one hell of a manuscript, very interesting read). 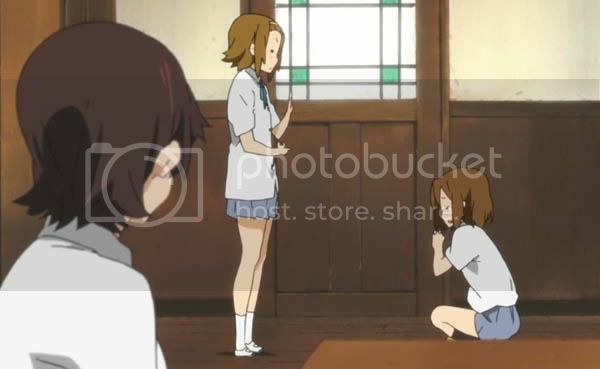 He later wrote in a second book "Meditations" that the line gives people the wrong idea about inference without logical thought or research, which is what Ritsu and Yui are doing. So yes, it is often misquoted. You can't just simply think that it isn't hot when the weather is boiling, however, you CAN think that the heat is nothing to something compared to lugging a 30-40kg fieldpack and a rifle walking 24 kilometres on foot in a jungle*. The difference is that the second part is a comparison to something practical, while the first part is just theoretical, thus the first is illogical as referent to the second. * - Yeah. I have done that before. Never again. Yeah, lily pads. Electronic version, and asserts a lesbianating influence over the user rather than a normal "use me, not another brand" aura. Ehhh, that one was still one-sided cause Mio was "faithful". Guah, I'm probably a bit asspained about some people saying that Azusa is a dumbass for quoting that. I usually would throw a facepalm when that is misquoted, but for Azunyan......that makes her look cute! Makes me want to cuddle and kiss her and tell her gently that she got it all wrong. Ok that is making me sound like a pervert. CoalGuys has now officially stated that the Descartes quote was a mistranslation. Dammit. There goes a cuteness point for Azunyan. Filler to the max, but at least it was an enjoyable filler. +1 for the double entendre. Not so! It was mentioned in the first episode of this series, when they're talking about their aspirations for the coming year. Couldn't tell you the exact time, but I'm certain it's in there somewhere. I'm curious to your definition of 'filler' then. It's probably another kind of safety charm - the type that protects her from being single for the rest of her life. It's impossible not to be since each chapter is like 8 pages long and they are not connected with each other except the one with play which has 2 chapters dedicated to it. It's a folktale reference isn't it? About that logger whose axe fell into a lake and a spirit made him choose between a gold axe, a silver axe and a regular axe.